Dallas police say a criminal investigation has been initiated involving Cleveland Browns quarterback Johnny Manziel. NBC 5 has also learned a Fort Worth police detective has been assigned to investigate claims against Manziel. In a press release Friday evening, the Dallas Police Department said it received a complaint of domestic violence that occured in Dallas on Jan. 30 in which Manziel is listed as a suspect. The department said detectives will investigate the case to determine what criminal charges, if any, will be filed. Manziel's former girlfriend got a protective order against the former Texas A&M University star. The order says Manziel must stay at least 500 feet from the woman's home and place of work, and owes $12,000 in legal fees. The order was signed by district court Judge Mike Sinha on Wednesday. 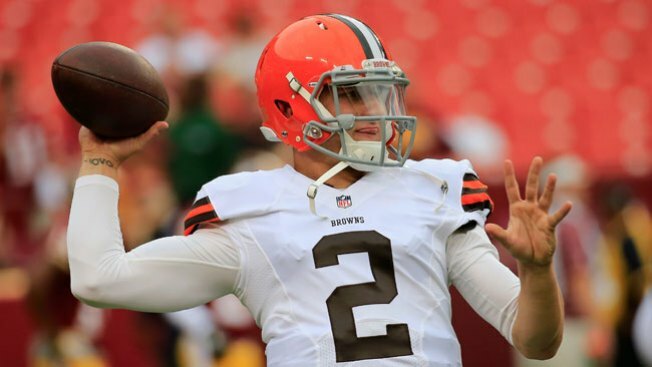 Johnny Manziel's agent announced he has severed ties with the 23-year-old Cleveland Browns quarterback the day after police released a report alleging that Manziel hit his girlfriend several times. Erik Burkhardt said that with "deep regret" he has ended the business relationship with his client, Manziel. He added that he made his decision after "several emotional and very personal discussions with his family, his doctors, and my client himself." "His family and I have gone to great lengths to outline the steps we feel he must take to get his life in order. Accountability is the foundation of any relationship, and without it the function of my work is counterproductive. I truly wish the best for Johnny and sincerely hope he can, and will, find the kind of peace and happiness he deserves. Police released a report Feb. 4 stating that Manziel's ex-girlfriend, Colleen Crowley, told police Manziel struck her several times at a Dallas hotel Jan. 29. She said Manziel acted as if he were on some kind of drugs, but said he wasn't intoxicated. She said she and Manziel left the hotel in her vehicle and headed toward her Fort Worth home. According to the report, he shouted angrily and hit her several more times during the drive. Fort Worth police Cpl. Tracey Knight said officers did not arrest Manziel, but "an information report was completed regarding an altercation between Manziel and his girlfriend." NBC 5 reached out to Manziel and his representatives for comment, but have not heard back. Johnny Manziel's father, Paul Manziel, told The Dallas Morning News that his family is concerned for his well-being. Paul Manziel said his son has declined to be admitted to rehabilitation facilities twice in the last week. "I truly believe if they can't get him help, he won't live to see his 24th birthday," Paul Manziel told the DMN. The Cleveland Browns are expected to cut Manziel when the league year begins March 9, making him a free agent. Also, the league is looking into whether Manziel violated its personal-conduct policy. NFL spokesman Greg Aiello said Thursday the inquiry is "ongoing." Manziel was cleared of any wrongdoing last year after he and Crowley got into a heated roadside argument near the player's home. NBC 5's Ken Kalthoff and The Associated Press' Tom Withers contributed to this report.